Historically, yoga is a form of physical exercise originating in ancient India. This exercise includes a mixture of spiritual, physical, and mental disciplines and practices that have been used for centuries. 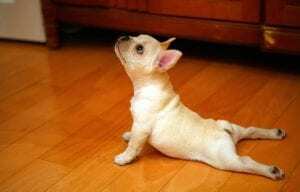 Yoga is an exercise that is used for health and relaxation advantages. Yoga offers a wide variety of health benefits such as better sleep, increased energy, improved muscle tone, improved circulation, and also helps lower blood pressure. 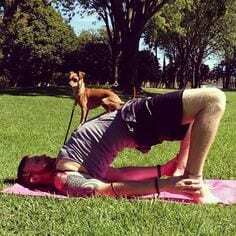 The practice of Yoga with your dog is known as “Doga.” Doga teaches your dog to trust you, improves health, and helps reduce anxiety. The savasana position is one of easiest yoga positions to perform. Simply collapse on the floor in an exhausted manner like a corpse while your dog gloats over you. The chaturanga is an uncommon yoga move, but very simple to do. All you have to do is get your dog to lay on his stomach. Once they are laying down stroke and massage his back lightly. The downward dog position is a simple traditional yoga move. When doing this position you must have your hands and feet flat on the ground with your body forming a v-shape. Once the shape is formed your dog lies on top of you. The seated bridge position is a simple traditional yoga move. You must create an arch with your body with your shoulders flat on the ground. 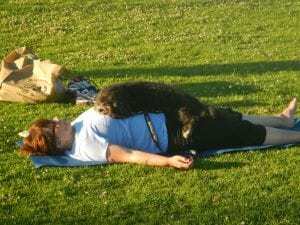 Once you have done that allow your dog to rest on your abdomen. The heart and hound position is a complex position. You must sit cross-legged with your dog positioned in front of you, with one hand on your heart, and the other hand on your dog’s chest. The forward bend position is a simple traditional yoga move. All you have to do is bend down and reach forward to lift your dog up at the end of the bend.